For Women's History Month, we honor some of the most influential women and moments in sports history. Are we missing your favorite iconic female athlete? Let us know in the comments section below. Considered one of the greatest athletes of all time, Mildred Ella "Babe" Didrikson Zaharias won three medals -- including two golds -- in track and field at the 1932 Olympics, was an AAU All-American basketball player and won 41 professional golf titles. She was a founding member of the LPGA Tour. Having picked up golf in 1935, Didrikson Zaharias became the first woman in history to play in a PGA event just three years later. While she missed the cut at the Los Angeles Open, she played in three PGA events in 1945 and made the cut in all three. She remains the only woman to make the cut in a PGA event. With a slew of records and honors, including being named the Associated Press' Female Athlete of the Year six times, Didrikson Zaharias even had an LPGA tournament named after her while she was still playing. She died in 1956 at the age of 45 due to colon cancer. 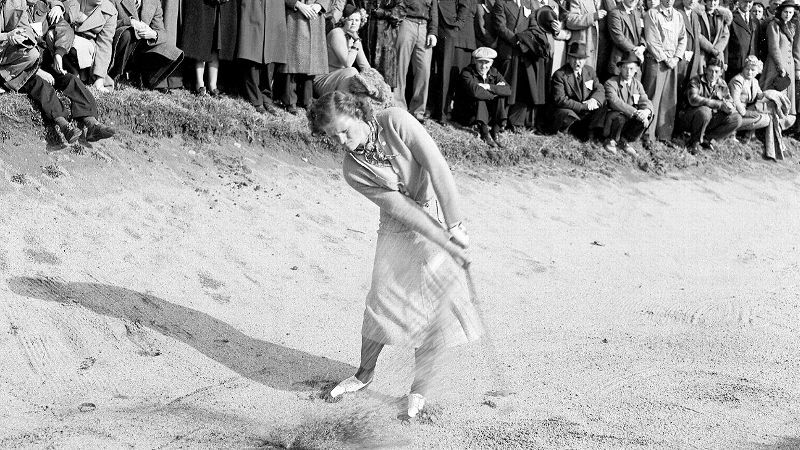 She played while battling the illness, winning two events in 1955, and was still a top-ranked golfer at the time of her death. 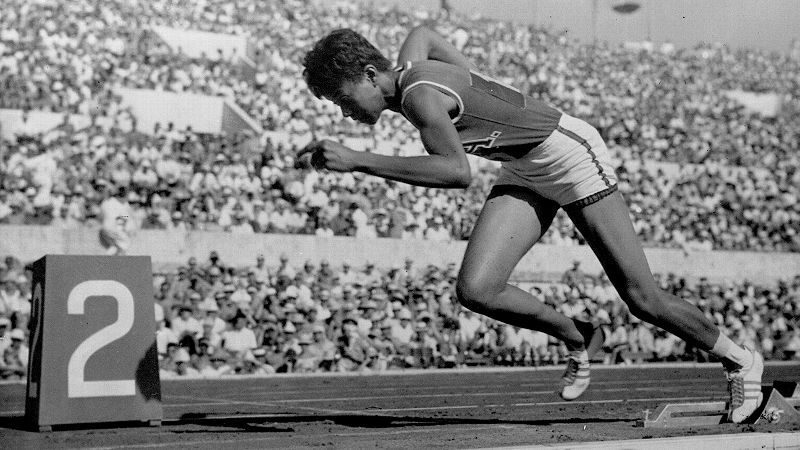 After childhood struggles with polio and related physical disabilities, Wilma Rudolph defied all odds at the 1960 Rome Olympics by becoming the first American woman to win three gold medals in track and field (100 meters, 200 meters, 4x100 meter relay) during a single Games. Her impressive feats, combined with the first-ever international television coverage of the Olympics, made her a star in the U.S. and abroad. She was named the Associated Press' female athlete of the year in 1960 and 1961. She retired in 1962 at the age of 22, but Rudolph remained a pioneer for both civil and women's rights. She passed away in 1994, but her legacy remains. During her legendary career, Billie Jean King won 12 Grand Slam singles titles and 129 singles titles overall, but it was perhaps her historic match against Bobby Riggs that warrants her spot here. Dubbed the "Battle of the Sexes," a 29-year-old King faced 55-year-old Riggs in front of 30,472 fans at the Houston Astrodome on Sept. 20, 1973. An estimated 50 million people worldwide tuned in to the television coverage. King, who entered the stadium Cleopatra style, defeated the brash Riggs 6-4, 6-3, 6-3. The win marked one of King's lasting achievements in a lifetime filled with activism for equality. Before Danica Patrick was even born, Janet Guthrie already had become the first woman to compete in both the Indianapolis 500 and the Daytona 500. Qualifying for her Indy 500 in 1977, Guthrie would participate in three races at the Brickyard during her career. Her ninth-place finish in 1978 would remain the best result by a woman until Danica Patrick took fourth in 2005. Over a four-year NASCAR career, Guthrie drove in 33 races. 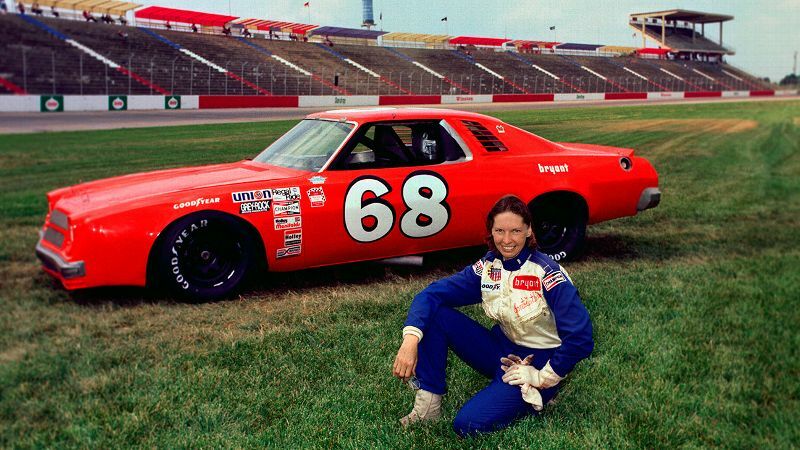 Her sixth-place finish at Bristol in 1977 is still the best by a woman in a top-tier NASCAR race. Starting in 1973 and spanning the next 15 years, tennis legends Chris Evert and Martina Navratilova met on the court 80 times, including 60 matches with a tournament title on the line. Navratilova owns a 43-37 career edge over her rival and longtime friend and a 10-4 advantage in Grand Slam finals. 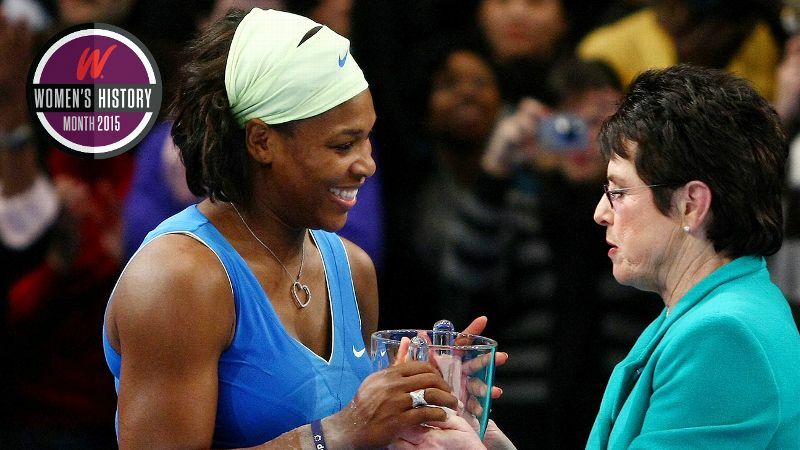 Each with 18 Grand Slam singles titles to her name, their on-court rivalry is considered one of the best in sports history and helped increase the popularity of women's tennis in the 1970s and '80s. Ann Meyers Drysdale was the first high school player to make a U.S. national team and the first woman to receive a full athletic scholarship from UCLA. 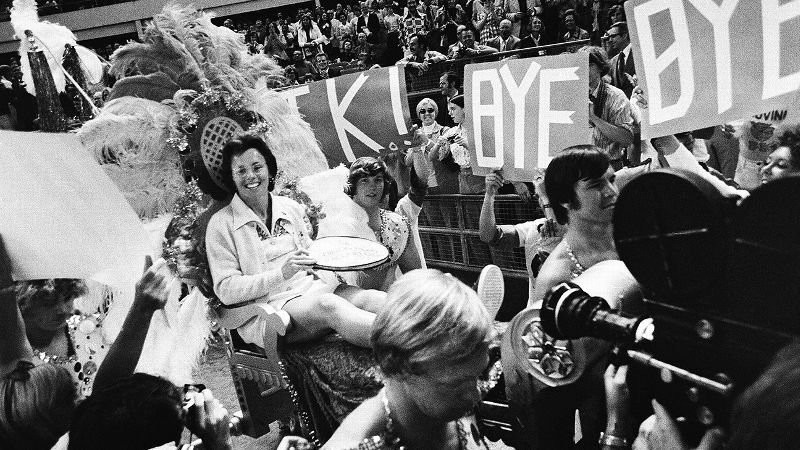 Meyers Drysdale made history when she signed an NBA contract with the Indiana Pacers in 1979. She failed to make the final roster but went on to play in the short-lived Women's Basketball League and is currently vice president for the WNBA's Phoenix Mercury and the NBA's Phoenix Suns. 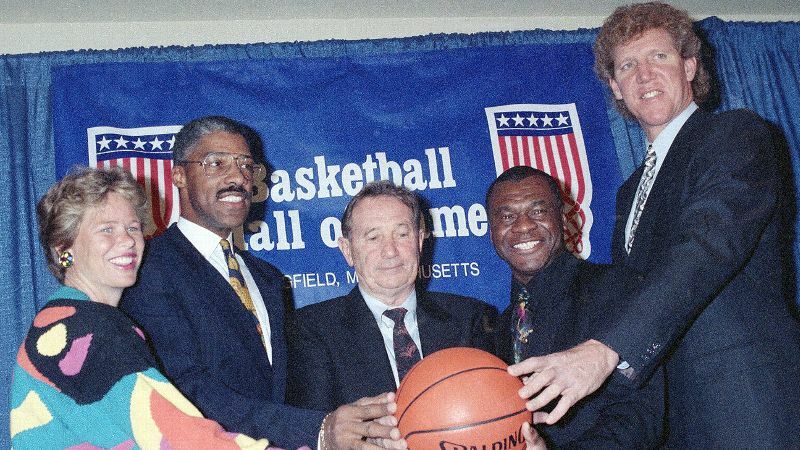 In 1993, Meyers Drysdale was inducted into the Naismith Memorial Basketball Hall of Fame. Sports Illustrated introduced Jackie Joyner-Kersee to mainstream America in 1987 when she appeared on the magazine's cover next to a headline reading "Super Woman." The next year, Joyner-Kersee went on to win golds in both the heptathlon and long jump at the Seoul Olympics, recording the still-standing world record of 7,291 points in the heptathlon. She retired from competition after the 1996 Games with a total of six medals spanning four Olympics. Sports Illustrated for Women named her the Greatest Female Athlete of the 20th Century. After lackluster results in the 1992 Olympics and the 1994 world championships, Team USA entered the 1996 Atlanta Games looking to regain the prominence of the American squads from the 1980s. With a roster that included superstars Lisa Leslie, Teresa Edwards, Nikki McCray, Dawn Staley and Rebecca Lobo, the team underwent a 10-month training tour prior to the Games. The rigorous preparation paid off, and the U.S. dominated the competition in Atlanta. The team averaged 102.4 points per game during its eight-game run en route to the gold medal. The U.S. defeated Brazil 111-87 in the championship game. With sell-out crowds and huge TV ratings, the team showed women's basketball was a viable entity in the United States. The WNBA began play the following year, founded in large part due to the success and popularity of the U.S. squad. With 1,098 career victories, Pat Summitt is the winningest coach in NCAA Division I basketball history. Named the head coach at Tennessee in 1974 when women's college basketball was yet to be recognized by the NCAA, Summitt turned the Lady Vols into a national power. 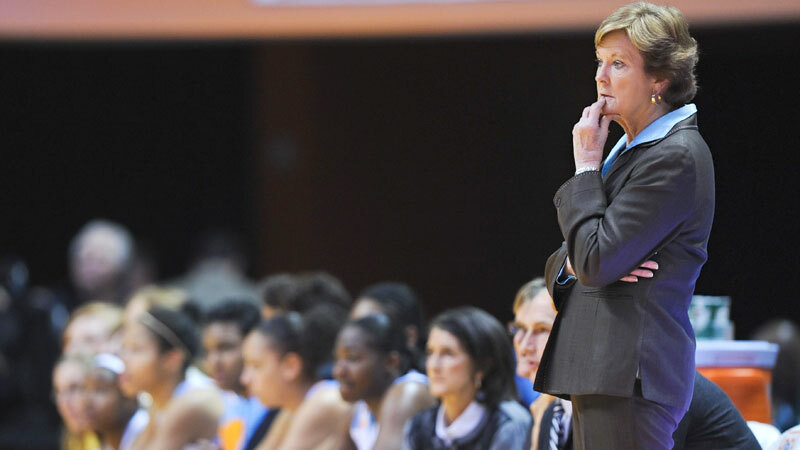 The team won its first national championship in 1987 and, under Summitt's leadership, the program won seven more titles before her retirement due to early-onset Alzheimer's disease in 2012. During her 38-year career, Summitt helped transform women's basketball from a club sport to one of the most popular sports in America. On July 10, 1999, the U.S. women's soccer team faced China in the Women's World Cup championship game. In front of a sold-out crowd of over 90,000 at the Rose Bowl in Pasadena, Calif. -- the largest crowd ever to attend a a women's sporting event -- the game was tied at zero at the end of regulation and remained scoreless through two overtime periods. A dramatic save by goalkeeper Briana Scurry during the penalty-kick shootout and a goal by Brandi Chastain (pictured) lifted the U.S. to the victory. Chastain's victory celebration, in which she took off her jersey and exposed her sports bra, instantly became an iconic and somewhat controversial moment seen on newspaper and magazine covers around the world. Sports Illustrated named the entire team their Sportspeople of the Year, and soccer saw an immediate rise in popularity in America. 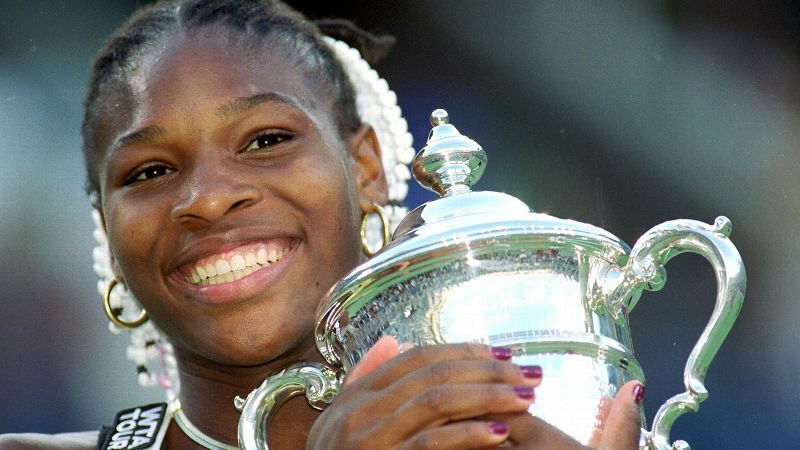 Before she was the top-ranked player she is today, Serena Williams was just a fresh-faced teenager from Compton, Calif. Serena served notice in the tennis community with her doubles win with sister Venus at the French Open in 1999. But she became a national sensation when she beat Martina Hingis for the US Open title in just her second full year on the tour. She became just the second African-American woman to win a Grand Slam singles title. Starting with her breakthrough moment at Flushing Meadows, Serena has won 19 Grand Slam singles titles, 13 in women's doubles and two in mixed doubles. She is the only female player in history to have surpassed the $50 million mark in career earnings. With 89 worldwide wins and 72 LPGA titles, Annika Sorenstam is widely considered one of the greatest women to ever play golf. The Swedish-born golfer was named the Rolex Player of the Year a record eight times and held the lowest seasonal scoring average six times in her 14 years on the LPGA Tour. Sorenstam won 10 majors and earned a record $22 million in her career. In 2003, she made history at the Colonial tournament when she became the first woman to play in a PGA Tour event since Babe Didrikson Zaharias in 1945. She missed the cut after shooting 5 over par after the first two rounds but set the stage for other women to follow in her footsteps. Danica Patrick burst onto the IndyCar scene in 2005 and instantly captured the attention of the sports world. In her debut at the Indianapolis 500, she became the first woman to lead a lap at the historic race, and her fourth-place finish was the best ever for a female driver. 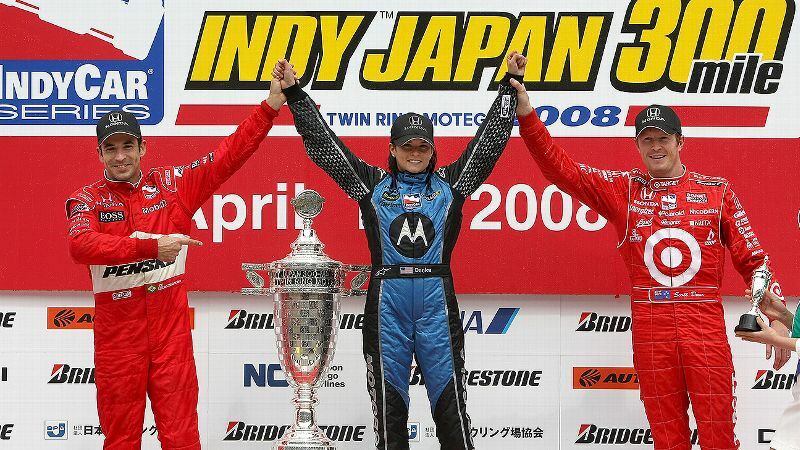 While her star continued to rise both on and off the track, Patrick cemented her place in history when she became the first woman to win an IndyCar race after topping the field at the Japan 300. Today, Patrick competes in the NASCAR Sprint Cup Series where she became the first woman win a pole at the 2013 Daytona 500. 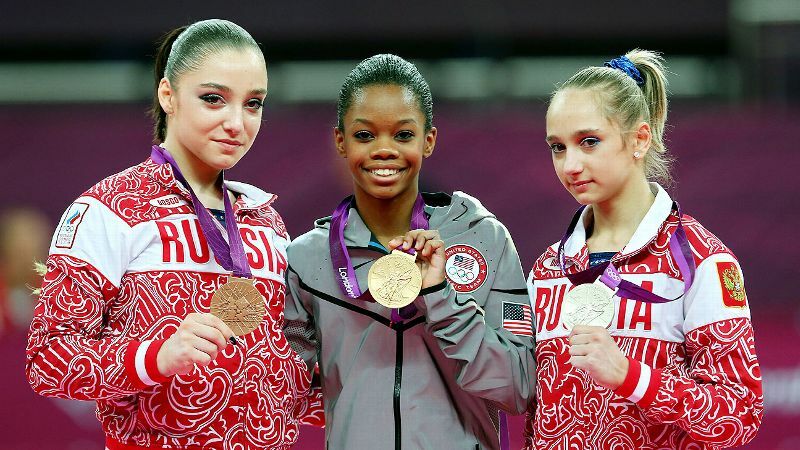 At the 2012 London Olympics, then-16-year-old Gabrielle "Gabby" Douglas became the first African-American gymnast in Olympic history to win the all-around title and the first American gymnast to take home the gold in both the individual all-around and team events. Later that year, she became just the fourth gymnast to be named the Associated Press Female Athlete of the Year. Her story was immortalized in her 2012 bestselling autobiography "Grace, Gold & Glory: My Leap of Faith" and in a TV movie released earlier this year. After releasing a second book, "Raising the Bar," and a brief absence from competition, Douglas has returned to training and looks to compete in the 2016 Olympic Games. 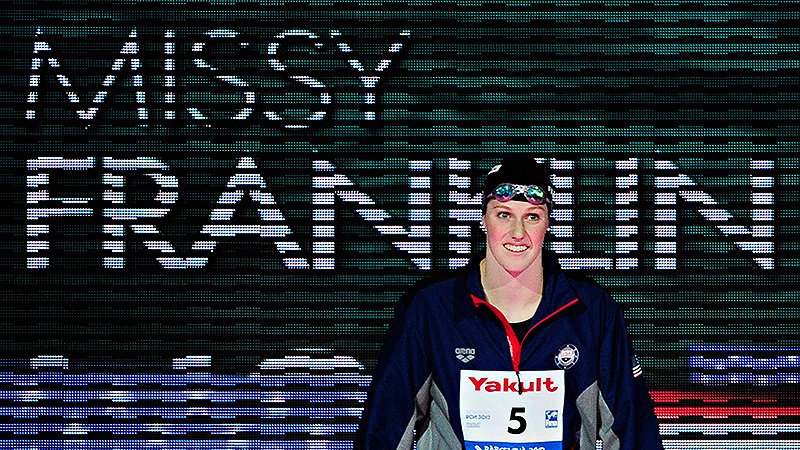 Missy Franklin emerged onto the national swimming scene at the 2008 U.S. Olympic team trials at just 13 years old. While she failed to qualify for the 2008 Games, she would quickly become a global force in the pool. In 2010, Franklin won multiple medals at the world championships -- her first podium trip in international competition. A known power by the 2012 London Olympics, Franklin took home an astonishing four gold medals and a bronze, setting the world record in the 200-meter backstroke and 400 medley relay. Her five-medal total was the most by any female competitor in London and second overall behind fellow American swimmer Michael Phelps with six. In 2013, she became the first woman to win six gold medals at a single world championship. Franklin, 19, is a sophomore at Cal and just helped lead the swim team to another Pac-12 title. Thirteen-year-old Mo'ne Davis was the face of the Little League World Series in August 2014 after she became the first girl to win a game in LLWS history. 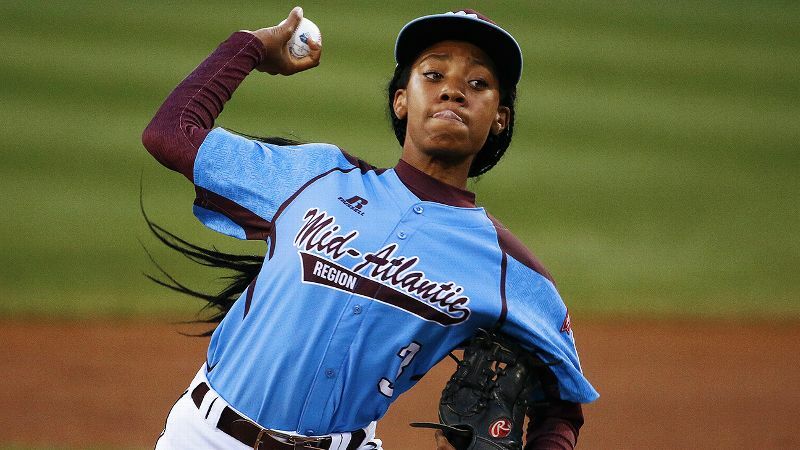 With a 70 mph fastball, she led her Philadelphia team, the Taney Dragons, to a 4-0 victory over Nashville, Tennessee. She was later named the youngest-ever AP Female Athlete of the Year, and was selected as Sports Kid of the Year by "Sports Illustrated" -- among many other accomplishments. Davis, a multi-sport prodigy, actually names basketball as her favorite sport. She plays on the high school girls' varsity basketball team (even while in eighth grade) and on the otherwise all-boy Anderson Monarchs baseball and basketball teams.